In 1928, a crew of four men flew, for the first time, across the Tasman from Australia to New Zealand. One of the men on board the Southern Cross airplane was a New Zealander named T.H. McWilliams. couldn’t see out of his front windscreen. Yikes! Fortunately, the plane made it all the way across the Tasman landing in Christchurch after a 14 hour trip. So Anxious alittle I'm afraid of highs. I think it was raining when a fly there. It took forever and ever to get to christchurch. It was a long ride though and tough. 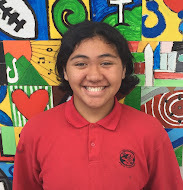 This is Jade C from the Summer Learning Journey blogging team. Wow you have done a great job Hazel. You had many descriptive language features such as and many interesting adjectives, it allowed me to imagine the scene while I was reading the poem! You put yourself into the aviator's shoes and wrote the poem in his perspective, also well done for including some rhyming words in your poem. (forever and ever, though and tough) Rhyme creates rhythm when the poem is read out loud, and it makes the poem interesting for the readers to read. Now I can't wait to read your next blog post!